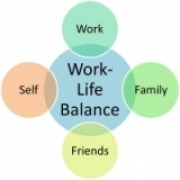 Work–life balance is a concept including proper prioritizing between "work" (career and ambition) and "lifestyle" (health, pleasure, leisure, family and spiritual development/meditation). This is related to the idea of lifestyle choice.The work–leisure dichotomy was invented in the mid-1800s. We´ll see how it is more relevant today than ever! I agree with Nigal, it is a balancing act and I hypothesise that the happiest performers are the ones that put into practices this maxim I learned from Ghost Dog: "Matters of great concern should be treated lightly." Master Ittei commented, "Matters of small concern should be treated seriously."